Maximilian Jösch started studying astronomy at the Pontificia Universidad Católica de Santiago (Chile) and later moved to Tübingen and Munich (Germany) to finish a degree in biochemistry (2005). He obtained his Ph.D. (2009) in the laboratory of Alexander Borst at the Max Planck Institute for Neurobiology (Munich) and worked as a post-doctoral fellow with Markus Meister and Joshua Sanes at Harvard University, MA (USA) (2010-2016). 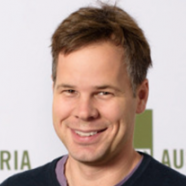 In 2017 Maximilian was appointed Assistant Professor at the Institute for Science and Technology Austria, where he leads a research team focused on understanding the neuronal basis of visual transformations and their roles in instructing innate behaviour. Our lab studies the neuronal basis of innate behaviours, i.e., the processes implemented by neuronal circuits to transform sensory information into motor commands. Using a combination of molecular and physiological approaches, we monitor brain activity during animal behaviour to reveal the principles and motifs of neuronal computation. Two different model organisms, the mouse and the fruit fly (Drosophila melanogaster), are being used in parallel to take advantage of their unique strengths and gather a general understanding (across species) of computational principles. Experiments in the mouse focus on understanding the mechanisms used by the nervous system to attend behaviourally relevant information from the eye to the brain, e.g., to quickly detect a red apple in the green foliage. By conducting experiments in the fly, we intend to obtain a comprehensive understanding of the molecular, anatomical and physiological instructions conveyed by a highly defined circuit involved in course control.